The diamond-shaped Crimean Peninsula clings to the mainland by two small strips of land, with the rest of the region entirely surrounded by sea. Towering mountains, lush forest, picturesque beaches, curious cave cities, and vast vineyards populate the almost-island, providing a long, rich list of things to do. The scenic and varied landscape makes it an ideal vacation destination for adventurous hikers and keen cyclists. However, be warned that there is little signposting along routes. 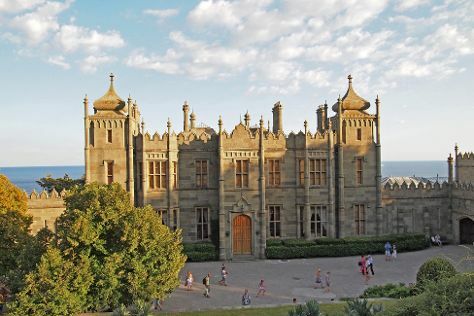 Those interested in the history and culture of the region will relish the opportunity to observe the legacy of Crimea's many Imperial rulers from over the centuries, evident in its architecture, cuisine, culture, and ethnic diversity. After the Ukranian revolution of 2014, Russia annexed the majority of the peninsula, thrusting it into the center of international attention. Crimea is in Europe. Use our Crimea trip planner: Crimea and all its delights await.